A Remote Monitoring software utility is a spy software tool that captures and records what a user on your computer does - often in stealth - from a remote location. Activities that are recorded by our powerful spy software solutions include keystrokes typed, websites visited, chat conversations, applications ran, emails sent and received, files opened, and much more. 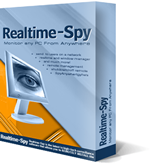 Our remote spy software tools, such as Remote Spy Suite and Realtime-Spy, can operate in total stealth so that you will not have to worry about users discovering you are monitoring them - and even if you inform them they will still not be able to tell how. Activity logs can be accessed from remote locations so you do not have to be at the monitored computer to view activity logs. Our Remote Monitoring tools are popular among parents, employers, spouses, security professionals, and network administrators because they leave no doubt in their minds as to what their computer users are doing and how their computers are being used. Our remote monitors can be installed remotely via email or over a network without the user knowing (if preferred)- allowing for totally concealed remote monitoring. 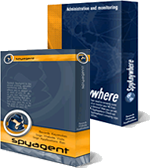 Our Spy Suite combines SpyAgent and SpyAnywhere - two award-winning spy software tools - into one package to create the most robust remote spy and administration solution available anywhere. View all user activity logs remotely, while being able to remotely control the monitored computer via your web-browser. The Spy Suite creates the ideal tool for remote and local computer monitoring, content filtering, and administration. 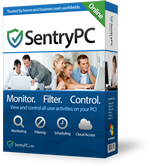 SentryPC is a cloud-based monitoring solution that enables you to control, restrict and monitor access and usage of your PC from anywhere. You can control how long and when users are allowed to use the computer, prevent the use of specific programs, block access to certain websites, restrict access to Windows functions and more. In addition to access control, SentryPC can also record all activities, including keystrokes, website visits, applications ran, chats, and more. All logged activities are viewable in real-time from anywhere via your online cloud account. 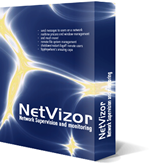 NetVizor is the latest in network monitoring software. Monitor your entire network from one centralized location! NetVizor allows you to track workstations and individual users that may use multiple PC's on a network. NetVizor records everything users do - from keystrokes typed to email activity. NetVizor can show you what everyone is doing on your network, in real-time, with a single mouse click via its visual network overview and real-time activity ticker. Combining real-time remote surveillance with complete individual user monitoring, report creation, and security auditing, NetVizor is the most comprehensive network monitoring solution available!